Born and raised in Alexandria, St. Cyril succeeded his uncle Theophilus as bishop of the city in 412. His early career (412-428) was dedicated to the exposition of the Scriptures and the refutation of heretics and unbelievers. The second period of his episcopate (428-433), more intense and fruitful than any other, was marked by his opposition to Nestorius. Cyril's stand, strengthened by his alliance with the Church of Rome, led to the summoning of the Council of Ephesus (431) which ended with Nestorius' condemnation. 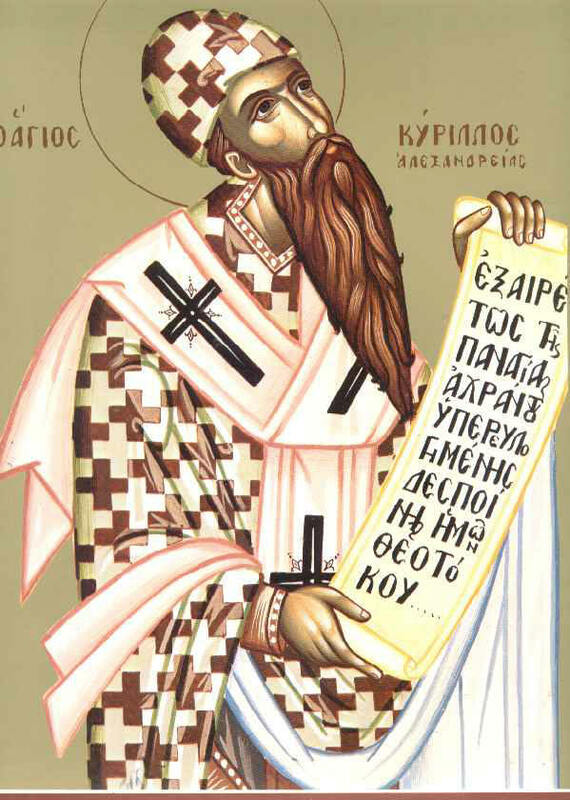 The last period of Cyril's life (433-444) was reasonably peaceful, though he had to explain his teaching to critics from both the Alexandrian and the Antiochian sides. Cyril is one of the most distinguished theologians of the early Church, recognized by his contemporaries and his successors in the East (Chalcedonian Orthodox and anti-Chalcedonian Monophysites) and in the West (Roman Catholics and Protestants). He is the first father to establish firmly the patristic argument, which appeals to the earlier fathers of the Church for the right understanding of the apostolic preaching and the gospel of Christ. 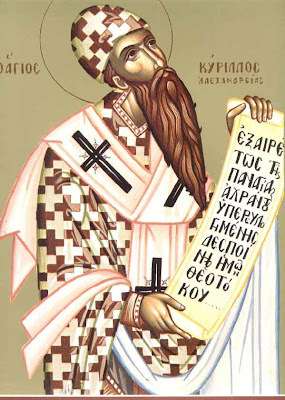 Following Athanasius and the Cappadocians, Cyril accepted the Nicene homoousios, the three hypostaseis of the Father, the Son and the Holy Spirit and the unity of the divine ousia seen in the three hypostaseis and expressed in their common will and activity. He is not as original in the content of his triadology as in the presentation of it, and he is not so much interested in the "essential Trinity" as in the "economic", because of his soteriological interest which he inherited from Athanasius. As far as the essential Trinity is concerned, Cyril emphasizes both the co-inheritance of the three hypostaseis or persons and the primacy of the Father from Whom the Son is born and the Spirit proceeds. Yet Cyril does speak of the procession of the Spirit from both the Father and the Son, but with reference to the common essence of the Spirit with the Father and the Son. Christology is the key to Cyril's theology and the topic to which his contribution became decisive for the early Church and subsequent generations. His terminology initially presented certain problems, because it was flexible and equivocal, but his thought was clear and helped to clarify and eventually settle problems related to linguistic formulations. He followed Athanasius' principle that theological disputations were not about terms but about the meaning embedded in them. This is why Cyril could use the term physis (nature) as equivalent to both hypostaseis or person and ousia (substance, essence) and so speak of "one nature of God the Logos incarnate" and "one person of God the Logos in (from) two natures". Thus, it is unfair to argue that he changed his mind in Christology from a monophysite to a dyophysite standpoint. Cyril has been unfairly accused of Apollinarianism both by his Nestorian opponents and by modern patristic scholars who wish to stress the humanity (or, specifically, the psychology) of Christ almost independently of the Logos/Son of God. Equally unfair is the modernist charge that Cyril's Christology is only a Christology "from above". The doctrine of the two births of Christ does not imply the either/or schema "from below" and "from above", but brings the two together in the mystery of Emmanuel, His kenosis, His economy, His hypostatic union of the two natures, His communication of idioms (properties) and, above all, in His Virgin Mother, who is true Theotokos (God-bearer). Cyril understands salvation in terms of both "participation" in and "imitation" of the human nature in relation to the divine nature, objectively in Christ and subjectively appropriated by human beings through the Holy Spirit who acts in and through the Sacraments. The objective aspect of salvation in Christ is particularly stressed in his doctrine of justification by grace developed in a masterly way in his evangelical interpretation of the law in On Worship in Spirit and in Truth. Cyril's theological legacy has been influential in all Christian contexts in the East and in the West. A contemporary positive reassessment of his legacy would prove especially beneficial for the current ecumenical dialogue, since it affirms the basic dogmatic perceptions of classical Christianity. Cyril was a prolific writer who wrote in Attic Greek and had an extensive knowledge of the Classics, the Scriptures and the Fathers, especially Athanasius and the Cappadocians. his many Commentaries demonstrate his biblical orientation. He employed the typological and historical methods of interpretation which are most clearly set out in his writings On Worship in Spirit and in Truth and the Glaphyra on the Pentateuch. Cyril's anti-heretical dogmatic works are numerous, the most substantial being: Thesaurus on the Holy and Consubstantial Trinity, Dialogues on the Holy and Consubstantial Trinity and Five Books of Negation Against Nestorius' Blasphemies. in the last-named he argues for a true and personal (kath hypostasein) union of the divine Logos/Son with the flesh born from Mary, against Nestorius' Christology based on a conjunction (synapheta) between the divine Logos and the man born from Mary. Cyril also argues for two births of one and the same (divine) Son, one (divine) in eternity and one (human) in time, whereas Nestorius' argument implies two Sons, one divine and one human, who are conjoined in Christ. From Hagios Kyprianos magazine, 3rd issue, 1997.